But truly the Almighty Creator of the Universe, the Invisible God Himself from heaven planted among men the truth and the holy teaching which surpasseth the wit of man, and fixed it firmly in their hearts, not as any man might imagine, by sending (to mankind) a subaltern, or angel, or ruler, or one of those that direct the affairs of earth, or one of those who have been entrusted with the dispensations in heaven, but the very Artificer and Creator of the Universe Himself, by Whom He made the heavens, by Whom He enclosed the sea in its proper bounds, Whose mysteries all the elements faithfully observe, from Whom [the sun] hath received even the measure of the courses of the day to keep them, Whom the moon obeys as He bids her shine by night, Whom the stars obey as they follow the course of the moon, by Whom all things are ordered and bounded and placed in subjection, the heavens and the things that are in the heavens, the earth and the things that are in the earth, the sea and the things that are in the sea, fire, air, abyss, the things that are in the heights, the things that are in the depths, the things that are between the two. Him He sent unto them. Was He sent, think you, as any man might suppose, to establish a sovereignty, to inspire fear and terror? Not so. But in gentleness [and ] meekness has He sent Him, as a king might send his son who is a king. He sent Him, as sending God; He sent Him, as [a man] unto men; He sent Him, as Savior, as using persuasion, not force: for force is no attribute of God. He sent Him, as summoning, not as persecuting; He sent Him, as loving, not as judging. 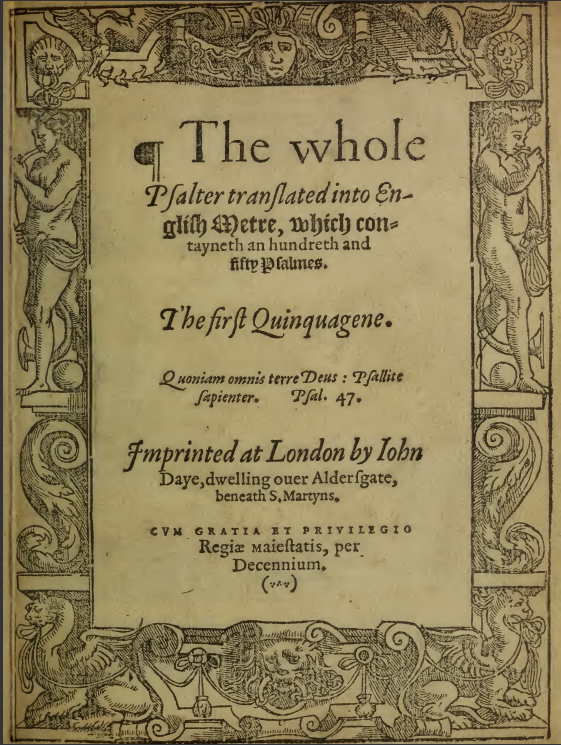 The Epistle as a whole is a fine early apologia for Christianity, despite its perhaps crude criticism of pagan and Hebrew religion; its description of Christians as ‘in but not of the world’, as the soul is in but not of the body, and dispersed throughout it, is simple yet telling. 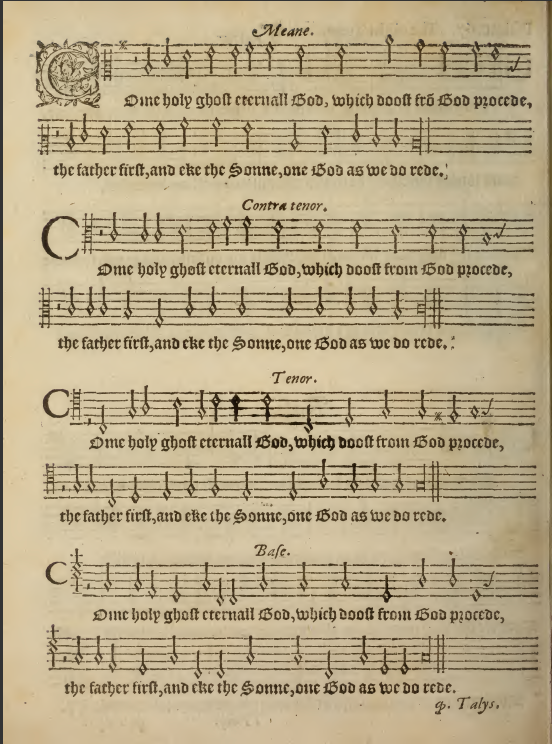 The music to which Fr Tucker’s text is mated has an interesting pedigree, being one of nine tunes written by Tallis in 1567 for the metrical Psalter of Matthew Parker, Archbishop of Canterbury 1559–75 (i.e., during Elizabeth’s reign), principal architect of the Articles of Religion, and instigator of the Bishops’ Bible. This ninth tune was paired in this Psalter with a version of the ‘Veni creator’ (the one non-Psalm or ‑Canticle paraphrase included, probably because it was appointed to be sung at ordinations and had been a medieval favorite – thus the common name of ‘Tallis’s Ordinal’ for this tune). The eighth tune is also known as ‘Tallis’s Canon’, and the third is famous for forming the subject of Vaughan Williams’s Fantasia on a Theme of Thomas Tallis (both of these also appear in the Hymnal 1982). Though perhaps among the most trivial pieces to come from the pen of so great a Renaissance master, these hymn tunes, revived in the twentieth century, have a certain nobility about them and stand up well to frequent use by congregations. The Psalter was printed by John Daye, the leading English printer of the time, who printed at a very high level of quality many Protestant texts including Foxe’s Actes and Monuments [Book of Martyrs]; the Sternhold & Hopkins metrical Psalter; Cuningham’s Cosmographicall Glasse; and works of Ælfric of Eynsham, for which the first Anglo-Saxon type was cut (Archbishop Parker was an important scholar and collector of old manuscripts; his library now resides at his old college, Corpus Christi, Cambridge).